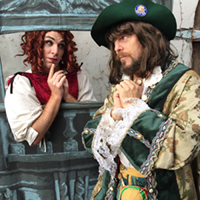 Fringe favourites S&F bring back their Fringe award-winning hit show: the classic tale of Cyranose de Bivouac's perfectly normal love for his cousin Roxanne. For the last half decade, seeing their name in front of anything they’ve brought to Fringe was reason enough to make sure I got a ticket to all of their productions. Sound and Fury is a trio of three very talented gents who are known for taking something popular and well known and putting their own spin on it as they blend pop culture with poetry and comedy. Set in 1642 during war between France and Noway, Cyranose is the story of a young man who possesses the power of words to woo and a strangely obsessive insecurity about the physical appearance of his nose. He is in love with his cousin Roxanne, whose heart belongs to Christian, a young soldier who is as bumbly with his words as I sometimes am on my feet. (Quite) Christian commandeers Cyranose to write love letters to Roxanne on his behalf, and the story unfolds as the characters realize each others’ true feelings and intentions. It is quite comical and charming. What I enjoy the most about Sound and Fury is the seemingly natural condition of their performances to feel both scripted and improvised at the same time. The three members play off each other extremely, connect with their audiences and make the viewer really feel as though they are part of the show. There’s never a dull moment and being part of the fun definitely adds to the appeal of their performances. This particular production had the feel of being in the early stages of performance, as the cast members scrambled to ensure they timed their queues correctly, fixed their wardrobe malfunctions and moved fluidly in and out of character at times, which I’m still unsure was accidental or deliberate. With every show presenting new opportunities for jokes and improvisation when needed, each night is unique and fun. It also demonstrated that even though there can be mishaps and unexpected turns throughout the show, this is part of this company’s charm and this trio is wildly entertaining. I never miss a chance to see them; you should follow my lead!